Last month I took a mozzarella cheese making class at The Brooklyn Kitchen in Williamsburg. The class was taught byRoberto Caporuscio, owner of New York's famed pizzeria Keste, as well as cheese specialist Tia Keenan. The classes at the Brooklyn Kitchen are a fabulous opportunity to sharpen your cooking skills, pick up some new skills, learn a new areas of cuisine or just plain relax and have some fun cooking. So far I have taken a fabulous apple pie tutorial and a New Orleans brunch class, and I am signed up to take a fresh pasta making class in the end of May. I am really tempted to take a mediterranean cooking class there next week as well. At any rate, on to the art of mozzarella. 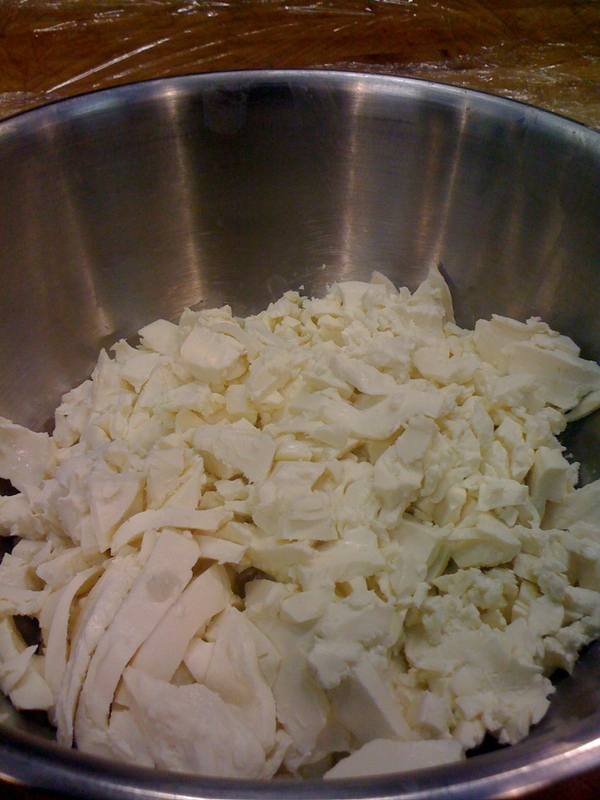 I learned from Roberto a bit of the skill of making mozzarella from cheese curds. We started with the curds rather than using renin to make the curs from scratch because it is near impossible to buy un-pasterized fresh milk in New York (since we don't raise cows here, ya know?) Also, it takes a tremendous amount of milk to make milk solids, which makes that process unrealistic. So what are curds? They are milk solids made from fresh cow's milk, separated from the whey. Most professional cheesemakers in the United States (particularly in more urban locations) start with fresh curds rather than renin and fresh milk to make mozzarella. Roberto taught us in the class the process that he uses to make his fresh mozzarella at Keste, which basically involves salting, submerging and heating the curds, stretching and manipulating them in the proper way, and forming proper balls of mozzarella. It is way harder than it sounds. I was able to replicate the process at home, but my mozzarella was still far inferior to the product Roberto taught us in the class because cheesemaking is an art, and clearly I am not yet a master of that art. But it was sure fun! This is the mozzarella roll - yum! Roberto's secret to making a fabulous mozzarella cheese (which you will be aware of if you have ever had his delicious pizza at Keste) is to add cream to the water that he uses to submerge the cheese curds in. The basic process involves cutting the curds to have a large amount of surface area, salting them, melting them in hot water and cream, and then stretching and working with the cheese to form mozzarella. In the class, we made both mozzarella balls and rolled out mozzarella that you can add other delicious ingredients to. This was some of the best mozz I've tasted to date. In the class, Roberto helped us form mozzarella balls so that you do not get air or water inside the mozzarella, which is harder than it sounds. You can buy all the supplies at the Brooklyn Kitchen and I plan on making another batch at home sometime this summer! I have included some pictures from the class in this post.